Hello Guys, Ajay Devgn 2018 upcoming movie Total Dhamaal release date, star cast and story plot. This is an upcoming comedy film, directed and co-produced by Indra Kumar. This is another sequel of film Double Dhamaal which was released in 2011 and this is the third film of Dhamaal film series. Ritesh Deshmukh, Arshad Warsi, and Javed Jaffrey reprise their roles and Ajay Devgn, Anil Kapoor, Madhuri Dixit, and Esha Gupta as new additions to the lead cast of this film. Once again, Indra Kumar directed another comedy film with the fresh concept, people are eagerly waiting for this film. The music of the film is composed by Himesh Reshammiya. The two iconic Bollywood song is recreated in this film first is Paisa Yeh Paisa from Karz film and second is Mungda from Inkaar film, performed by Helen. But in this film, Sonakshi Sinha is performing on the recreated song Mungda. 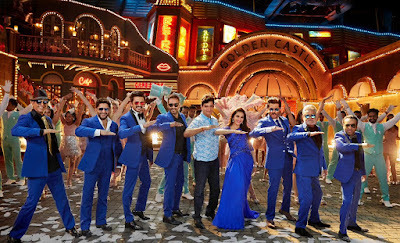 Here you can find all the latest information about Total Dhamaal like release date, first look and full star cast details. Total Dhamaal is set to release on date 7 December 2018. The film is releasing in 3D. Sonakshi Sinha in item number "Mundga"